Economic inequality and incarceration rates are known to have knock-on effects on other aspects of society. Forty-six percent of unmarried Americans hope to someday marry, yet falling rates of marriage make their prospects of tying the knot increasingly dim. A large body of research underpins the debate over the causes of this decline, variously identifying women’s increasing economic independence, changing attitudes toward marriage, and increased use of effective contraception as potential causal factors. Perhaps the most prominent theory in sociology, however, argues that a decrease in the number of “marriageable men” leaves women without partners. What makes a man “marriageable”? In addition to being a romantic arrangement and a family form, marriage is an economic institution. So, when men lack economic resources, they may be less likely to marry. Another factor that could affect marriageability is criminal justice involvement. When men are confined to jail or prison, or when a criminal record trails after them following release, they may become less attractive candidates for marriage. Interestingly, two trends may have simultaneously depressed rates of marriage in the United States. First, economic well-being has declined for people at the middle and bottom of the income distribution. Second, incarceration has boomed during precisely the same period in which marriage rates have fallen. In 1969, average earnings for men without college diplomas were 14 percent higher than in 2013. In 1969, about 200,000 people were incarcerated, but in 2013, that number was closer to 1.4 million. 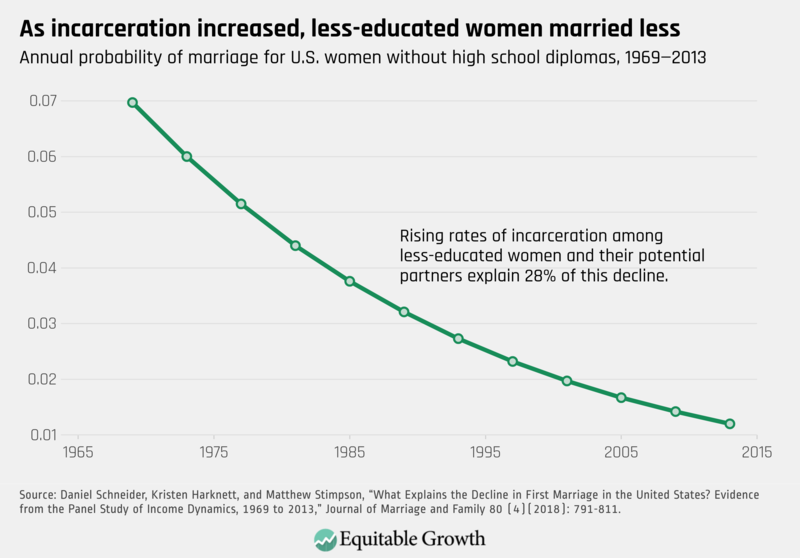 A 2018 paper in the Journal of Marriage and Family argues persuasively that the decrease in the number of marriageable men—due to economic hardship and incarceration—is a major factor driving the falling rates of marriage. 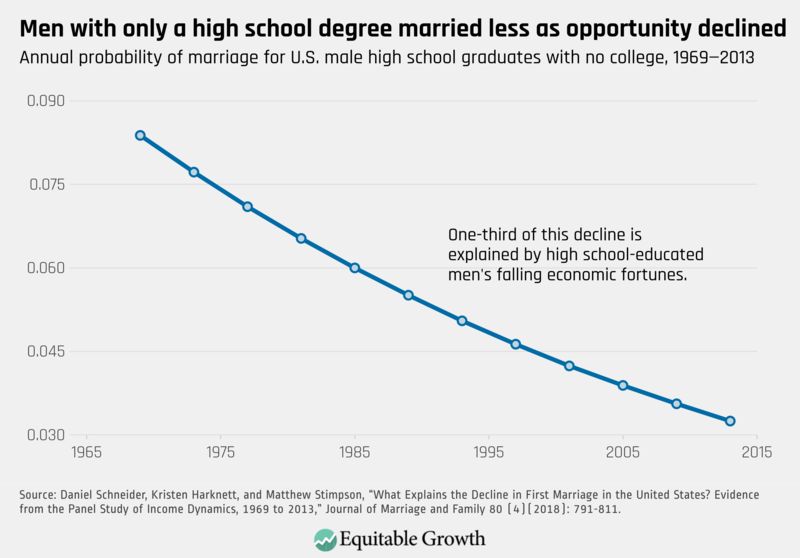 The paper, written by Kristen Harknett of the University of California, San Francisco and Daniel Schneider and Matthew Stimpson of the University of California, Berkeley looks across five decades of data from the Panel Study of Income Dynamics to document and explain the downward trend in marriage among men and women from 1969 to 2013. The work of these three researchers indicates that increasing inequality in the United States has consequences beyond the material circumstances of those at the bottom of the income distribution. Lower bank account balances, for example, affect people’s romantic lives and family composition. What does this mean for policy? Because other research shows that married people have higher rates of economic security, some experts call for the promotion of marriage. Schneider and his co-authors’ work suggests that these policy proposals may be putting the cart before the horse. If policymakers instead start by improving economic circumstances, rates of marriage are likely to increase. This could lead to a virtuous circle, in which people have the resources they need to form the families they desire, which, in many cases, may further bolster their economic circumstances or insulate them from economic hardship. Schneider and his co-authors also show that incarceration has effects that ripple beyond the immediate impact on the confinement of and concomitant declines in well-being among incarcerated people. Incarceration affects not only the family relationships of African American and low-educated men who are most likely to be incarcerated but also the family formation of low-educated women. While much literature investigates whether marriage is a protective factor against justice involvement, policymakers may again wish to move the proverbial cart and focus on the long-reaching benefits that reducing incarceration may have for families.